What Do the Midterm Results Mean for the Environment? Now that the polls have closed, what do the results hold in store for environmental policy on a local, state, national and even global level? Join us in EAB 253/262 at 12pm for this midday event hosted by the Missouri Sierra Club and Webster University Sustainability. 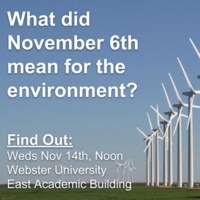 We'll address the question: "What did November 6th mean for the environment?" Free lunch available on a first come-first serve basis. Please RSVP to identify potential audience size.